Many modern mass spectrometers will produce raw datasets containing more than one type of scan data. For example, a common experiment using a Thermo Orbitrap instrument is to select the most abundant precursor ions and either independently fragment them using both ETD and CID fragmentation, or use a decision tree to select different fragmentation methods depending on, for example, the charge state [e.g. Frese, C. K et al., J. Proteome Res. 10, 2377–2388]. These different fragmentation methods will usually produce different ions series for the same fragmented peptide. A more detailed overview of the different ions you can expect from peptide fragmentation using different methods can be found on this help page. The set of ions series to be considered in a Mascot search are specified by selecting the Instrument type from the drop down list on the search form. If an ions series is not part of the selected instrument definition, then it will not be considered by the search engine, no matter how intense the peaks are. Therefore, it is important that your instrument definitions contain all of the MS/MS ions series that you expect to see for the particular instrument type. However, you should not include all possible ions series just in case. Doing that will increase the search space and decrease the search specificity, meaning that while the score for the correct match is unchanged, the score distribution for random matches is increased. As you can see, this instrument definition contains the combined ions series from the CID and ETD instruments. If your Mascot server does not contain this instrument definition, then you can find details on how to add it in chapter 6 of the Mascot Setup & Installation Manual. The disadvantage of this approach is that we’re always including non-significant ions series in the Mascot search for each MS/MS peaklist that is searched – for example, we’ll be including b-series ions in searches of ETD derived peaklists and c-series ions in searches of CID derived peaklists. As described earlier, this will increase our search space and decrease the search specificity. 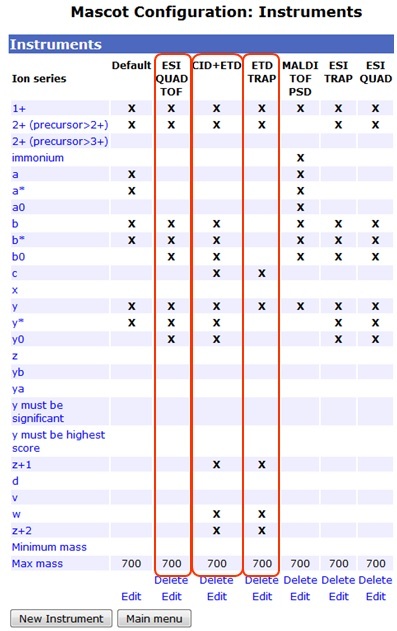 In theory, you could get better results if you could search each peaklist type using the correct instrument definition. 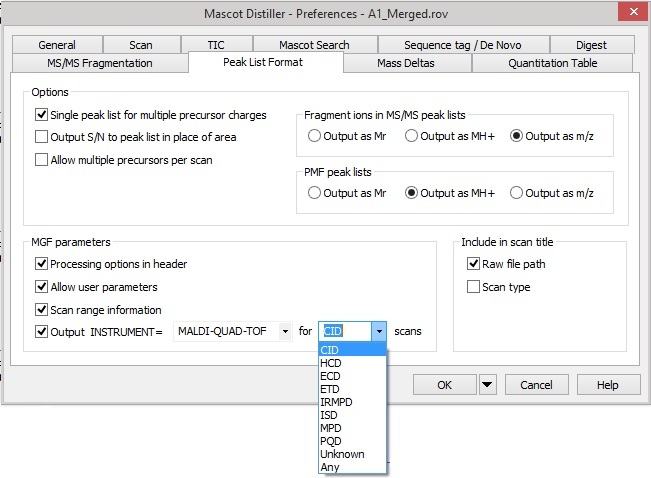 So, while using the combined instrument definition is giving acceptable results, we are seeing significant improvements in both the results and the speed of the search by separating out the instrument definitions for the two different types of spectra, a process which is made trivial in Mascot Distiller 2.6.